As a (HUGE) newfound fan of the Watchmen series, I knew I just had to get these Before Watchmen series from my local library so I could read up as much as possible on the characters from Watchmen. While these aren’t written or illustrated by the same folks who produced the original Watchmen comic I’d say they were about just as good. I wasn’t a huge fan of how Ozymandias was drawn because his face looked a little strange to me, but Crimson Corsair was well done. 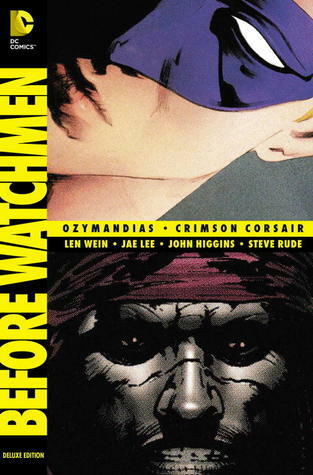 I really did like the writing though and I loved how it lead right up to where Watchmen starts. I was a little confused over the Crimson Corsair story. I couldn’t remember where he popped up in the original comics and figured he must be a character from the other comic book that is featured within the Watchmen series (someone please correct me on that if I’m wrong. I really am curious as to where he fits in on all of this). There was also a small section of one of the original MinuteMen, Dollar Bill, which was short but sweet and I appreciated just as much. Ozymandias is one of my top two characters from the series (the other being Rorschach) so I of course was enthralled by his story. However, even though Crimson Corsair was not one of my favorites I was still pulled in nonetheless. I can’t wait to start reading the next one’s!